In 1770, The Turk made its first appearance in front of the Viennese court. On a signal from the Empress Maria Theresa, Baron Wolfgang von Kempelen slowly wheeled his creation forward. The one-meter-high wooden cabinet with a large chessboard screwed to its top ran on four brass casters that not only allowed it to move freely, but also raised it slightly off the floor so that the audience could see that there was nothing hiding underneath. Behind the box sat a figure, dressed in Oriental clothing and a bulky turban. Kempelen opened a door on the left of the cabinet to reveal an elaborate mechanism of cogs, wheels and levers. Then, opening a corresponding door at the back, he held up a candle whose light flickered through complicated innards. After closing the doors, Kempelen wound up the contraption by turning a large key in the cabinet. Suddenly the figure came to life, reaching out with its left arm to move the chess pieces around the board. Every dozen moves or so, Kempelen wound up the device again, but never actually touched the figure itself. The Turk, so called due to its attire, managed to defeat a number of challengers. The Turk’s sensational performance that day astonished and delighted the Empress and soon became the talk of Vienna. The presentation changed Kempelen’s life. The 35-year-old civil servant was born Farkas Kempelen in January 1734 in Bratislava, then Pozsony, capital of the Hungarian part of the dual monarchy. He was not actually a nobleman, although the title baron has often been attributed to him. Kempelen was formally introduced to the Viennese court by his father, Engelbert, a retired customs officer. The young man was very handsome, spoke several languages and made an immediate impression. He was given the important task of translating the Hungarian civil code from Latin into German, the official language throughout the newly united kingdom of Austria-Hungary. Kempelen’s translation was hailed as a masterpiece and he was soon appointed counsellor to the imperial court. In 1757, Kempelen married Franciska, a lady-in-waiting at the court. Tragically, she died suddenly a few weeks later and Kempelen retreated, shocked and grief-stricken, to his hobby of scientific experimentation. Now a wealthy man, he could afford expensive tools, materials and scientific equipment for his workshop. In 1766 Kempelen was appointed director of the imperial salt mines in Transylvania, by which time he had also remarried. He felt confident enough to put his scientific knowledge into practice and soon devised a system of pumps to drain the mines when they became flooded with water. Following the success of this project, he was asked to design the waterworks for the castle in Pozsony. In the autumn of 1769, Kempelen was invited by Maria Theresa to attend a scientific conjuring show presented to the court by a visiting Frenchman named Pelletier. Maria Theresa was particularly interested in science and had an unusually enlightened attitude toward it for her time. She challenged Kempelen to explain Pelletier’s tricks to her. He was so unimpressed by what he saw that he declared he could do better. He returned to the court six months later, this time as a presenter, with his Turkish wizard. Kempelen eventually took his invention on tour, travelling around the world and sparking vigorous debate about the extent to which machines could emulate or replicate human faculties. In Paris, The Turk played and beat Benjamin Franklin, the American statesman and scientist, who was a chess fanatic. The Turk also played Francois-Andre Danican Philidor, the best chess-player in Europe and, although The Turk lost, the match was considered a triumph. To modern eyes, in an era when it takes a supercomputer such as IBM’s Deep Blue to beat the world grandmaster Garry Kasparov, it seems obvious that Kempelen’s chess-playing machine had to have been a hoax - not a true automaton at all but a contraption acting under the surreptitious control of a human operator. Using 18th century clockwork and mechanical technology it now seems impossible to have built a genuine chess-playing machine, but at the time automata of extraordinary ingenuity were being constructed and exhibited across Europe, including Jacques de Vaucanson’s mechanical duck, Henri-Louis Jaquet-Droz’s harpsichord player and John Joseph Merlin’s dancing lady. Kempelen next took The Turk to London, at that time a centre for chess and also renowned for public displays of technical marvels. The Turk went on show in Savile Row and was a great success. A year later, Kempelen returned to Vienna, packed The Turk away into wooden crates and turned his attention to other inventions, such as an ambitious attempt to build a machine capable of imitating the human voice. This wonder could be seen in the halls of the Millennial Exhibition of Hungarian achievement. He also devised a writing machine for the blind. When Kempelen died in Vienna in March 1804, The Turk was sold to John Nepomuk Maelzel, an engineer and musician who wanted to make money from displaying the automaton to a curious public. The Turk’s most famous encounter during this period came in 1809, when it was shown to Napoleon Bonaparte. Napoleon tried to trick the automaton by deliberately cheating, but The Turk was not fooled and upset the board rather than beat him. In London in 1819 the computing pioneer Charles Babbage saw The Turk play. The following year, he challenged it to a game. Maelzel also took the Turk to the United States where the author Edgar Allan Poe was so intrigued by the ‘Automaton Chess Player’ that he published a lengthy thesis containing his own theories on how it worked. “Perhaps no exhibition of the kind has ever elicited so general attention as the chess player of Maelzel. Wherever seen it has been an object of intense curiosity, to all persons who think. Yet the question of its modus operandi is still undetermined,” wrote Poe, noting also that The Turk played with his left hand, a matter Poe considered highly significant. The secret of The Turk was finally revealed in January 1857 in an account written by Silas Mitchell, whose father Dr John Mitchell had bought the automaton when Maelzel died in 1838, to satisfy his own curiosity. He discovered that a person was concealed inside the cabinet. The clockwork machinery visible on its left-hand side extended only a third of the way along, so that the covert player could hide behind it, then slide along to the other end for the remainder of the demonstration. The human chess wizard would play by the light of a small candle, whose smoke was dispersed up a pipe to an aperture in the top of The Turk’s turban. 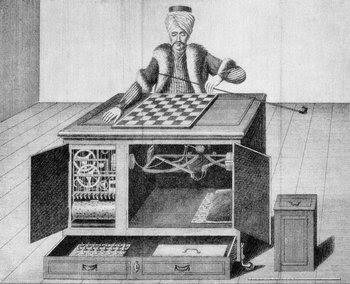 The operator watched a chessboard in front of him and moved a metal pointer which was connected to The Turk’s arm using a system of levers to move the corresponding piece on the external board. An ingenious system of magnets helped the operator follow the opponent’s moves. Kempelen probably used a series of operators in this elaborate trick, but one thing is certain, all were strong players, taking on some of Europe’s finest chess masters and losing to only the very best. Interest waned in The Turk once its secret was discovered and Mitchell sold the automaton to the Chinese Museum in Philadelphia. Some years later there was a fire at the museum and The Turk was totally destroyed. The reconstruction of The Turk at a German museum shows that, more than 230 years later, the ingenuity of the chess-playing ‘automaton’ still has the power to charm and intrigue. There is a non-working model of the Amazing Turk in the Roland Café in Bratislava – Kempelen’s home town. In 1770, the Hungarian engineer Baron Wolfgang von Kempelen built a chess-playing machine for the amusement of Habsburg Empress Maria Theresa. 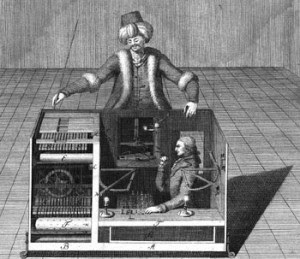 The mechanical device, designed to resemble a Turkish man, became the most famous chess-automaton in history. In April 2004, the Heinz Nixdorf Museum in Paderborn produced an incredible working replica of the Turk, 200 years after Kempelen’s death. Hundreds of chess fans and curious visitors gathered there on the presentation day to relive a scene that duplicated what the audiences had witnessed in Maria Theresa’s day. Professor Ernst Strouhal gave an introductory lecture on The Turk, and the reconstruction was then wheeled into the room. An actor took on the role of Wolfgang von Kempelen to demonstrate the operation of the machine. First he opened the two compartments to show that they were empty. Then he opened the left door to reveal a mass of cog-wheels, shafts and levers. The maestro closed the doors and wound up the machine. The Amazing Turk started to play chess. The figure standing behind the table was obviously artificial and could not conceal a human; however it executed chess moves with mechanical precision.